Fred Flintstone is a pretty normal guy. He's just like the rest of us. Every morning, he wakes up to the sound of a bird alarm clock and hops into his car, which is made mostly out of large stones. He operates a giant dinosaur at his job and then heads home to give his lawn a trim with his dinosaur lawnmower... alright, alright! So, maybe Fred Flintstone isn't exactly a normal guy by today's standards, but in the prehistoric time of Bedrock, he's the everyman. We bet that he stretches his feet out on his rock recliner and puts the game on the television to blow off some steam. Well, now it's time for you to get cozy like a caveman! With this Fred Flintstone kigurumi, you'll feel as comfortable as a prehistoric fella can! 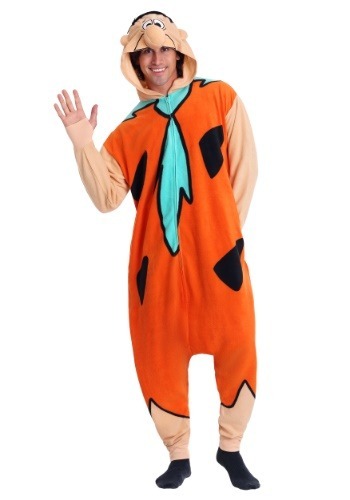 This ultra-comfortable pajama costume brings you a look inspired by the classic Hanna-Barbera cartoon character. The costume suit is made out of a soft, fleece material that's perfect for a light snooze, or a trip to your next costume party. It fits with a zipper in the front and features side pockets for all of your simple caveman needs. The front has the bright orange color of Fred's tunic and a blue tie around the neck. The hood is designed to look like Fred Flintstone's face, so it has a pair of cartoonish eyes and a plush nose attached to the top. If you've had a hard day at the quarry, then it's time to chill like a Flinstone! Just hop into this suit, find your favorite spot on the couch, and pop on the television—that's how Fred does it. It also works as a quick and comfortable cosplay costume for your next party!